The Accent Building Series provides an efficient storage building with maximum usable space. 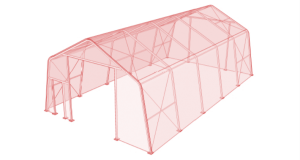 The single tube roof and wall support system mounts easily to the ground, foundation or walls. The standard large vehicle door opening offers maximum equipment and vehicle movement.